You know that familiar whirring sound. If your battery is on its way out, you can’t count on your car to get you where you need to go. Car batteries last an average of three to five years. Sometimes, batteries fail sooner. If you usually drive fewer than 20 minutes, the battery will not fully charge, resulting in diminished overall charging capability and a shorter lifespan. While most people associate winter with dead batteries, the heat of summer actually takes out more batteries. According to a study by the Car Care Council, heat causes the battery fluid to evaporate, damaging the battery’s internal mechanisms. If your battery is a getting up there in age or is giving you warning signs, don’t wait until you are stranded. 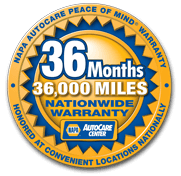 Our ASE-Certified Technicians can test your battery to assess its power and let you know if it’s time to replace it. If your car won’t start and it’s not a battery problem, it could be a malfunctioning starter or alternator. Whatever it is, our trained technicians will diagnose the problem and get you back on your way. Occasionally, you might experience some more minor problem. We can take care of those too! Headlight or taillight out? Sunroof, windows or door locks not working the way they should? Heated seats out of juice? Our trained technicians will inspect your electrical systems and troubleshoot the solution. Faulty fuses or wiring, whatever the culprit, we’ll fix it.